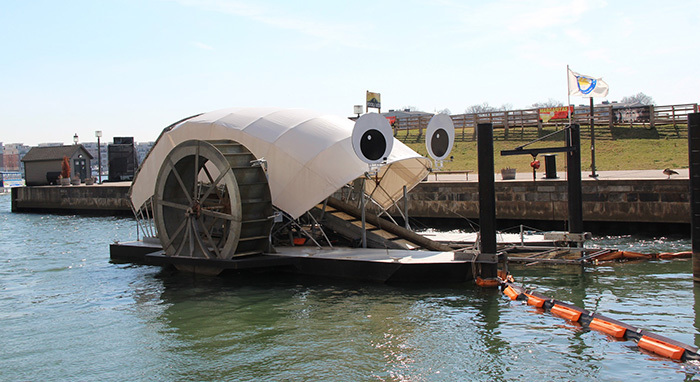 Mr. Trash Wheel is the world’s first permanent water wheel trash interceptor, to clean up the city’s polluted Inner Harbor. The Jones Falls river watershed drains fifty-eight square miles of land outside of Baltimore and is a significant source of trash that enters the harbor. Garbage collected by Mr. Trash Wheel could come from anywhere in the Jones Falls Watershed area. The wheel moves continuously, removing garbage and dumping it into an attached dumpster using only hydro and solar renewable power to keep its wheel turning. It has the capability to collect 50,000 pounds of trash per day, and has removed more than 350 tons of litter from Baltimore’s landmark and tourist attraction in its first 18 months, estimated as consisting of approximately 200,000 bottles, 173,000 potato chip bags and 6.7 million cigarettes butts. The water wheel has been very successful at trash removal, visibly decreasing the amount of garbage that collects in the harbor, especially after a rainfall. Baltimore’s Inner Harbor Water Wheel, or “Mr. Trash Wheel” to locals, combines old and new technology to harness the power of water and sunlight to collect litter and debris flowing down the Jones Falls River. The river’s current provides power to turn the water wheel, which lifts trash and debris from the water and deposits it into a dumpster barge. When there isn’t enough water current, a solar panel array provides additional power to keep the machine running. When the dumpster is full, it’s towed away by boat, and a new dumpster is put in place. Baltimore, Mr. Trash Wheel has removed more than one million pounds of garbage and debris since it launched in 2014. Explosive Bank Account 30 Day Challenge! Just listen to this short Meditation and see what happens!